SCOTTSDALE, Ariz., Feb. 01 /CSRwire/ - Tomorrow (Saturday), golf fans attending the Waste Management Phoenix Open are asked to wear green to celebrate the tournament’s sustainability initiatives. Known as GREEN OUT day, for every fan who wears green, environmentally focused charities, including Bonneville Environmental Foundation, benefit with a donation from the tournament host The Thunderbirds. 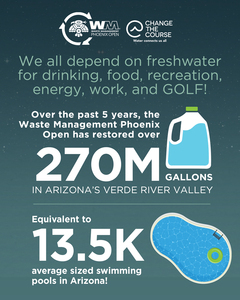 As Arizona endures nearly two decades of drought, the event’s water-positive impact--which puts more water into the Verde River than the week-long golf tournament uses--is especially important.